As we know that china is very expert to copy paste anything. It's uncountable now how much electronic goods made in china have launched to the world. But you should have know that china not only can copy paste a electronic goods, but nowadays china have developed high technology especially in military subject. U know that, china made surprised when they made J-20 invisible aircraft, that mean can't catch them by radar. It's reinforced when china try to invision territory of Taiwan. Comparingg with China Taiwan is nothing, but taiwan has power when they got protected by America. China often buy weapon from Russia to developing aircraft high technology, nowadays China is planning to make aircraft carrier. The amazing is china has approximately 60 submarine in which has nuclear launcher there, aircraft and good soldier. And for another England and American agent reported, they found many weapon it was made in china used by taliban soldier in Afganistan. The reason why Taliban did it because cheaper. 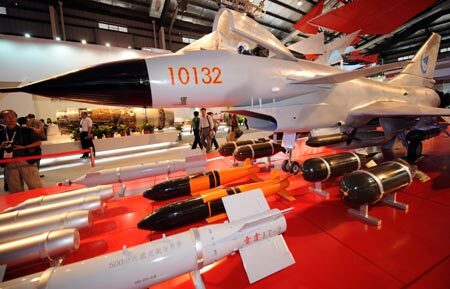 Washington post said recently China has rocket launcher that can fly up to 1 thousand and five hundred kilometres called Dongfeng and this rocket able to destroy the best american aircraft instead.